How important are hashtags when it comes to marketing? Hashtags are important identifiers and channel of communication. The proper use open paths for future social interaction, contact and communication. It is this interaction that will help further ideas, or perhaps, sell products and services. The hashtag plays a BIG role. Are you marketing with #Hashtags? Social Media lives 24/7 and never sleeps. It grows exponentially year in and year out. This is the new reality. People talk and share. They express ideas, dreams and have facilitated change. The power of Social Media is profound. It creates change. If you are marketing on line you want to make money. To make money you have to get social. That means you have to get up to speed on social media marketing. The following curated article by Dylan Kissane from Social Media Examiner will help clarify how important the hashtag is. 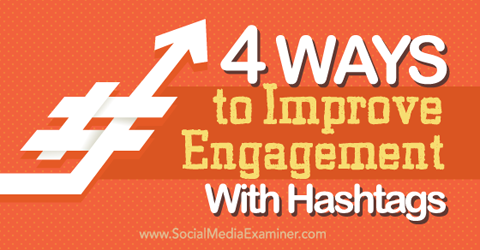 He shows you 4 ways to use hashtags that will give you the most bang for your marketing buck.